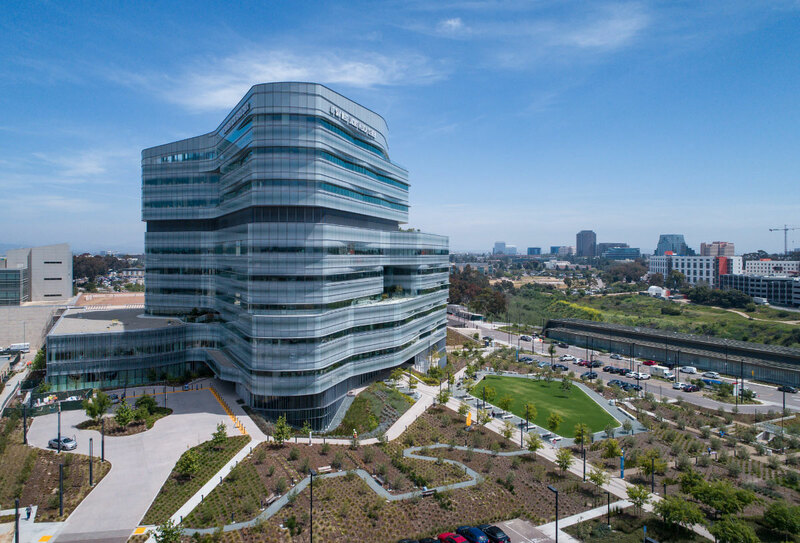 The Jacobs Medical Center at the University of California, San Diego campus—a sinuous hospital tower complex by the Yazdani Studio at CannonDesign—is out to change the future of architecture for patient-centered medical care facilities. 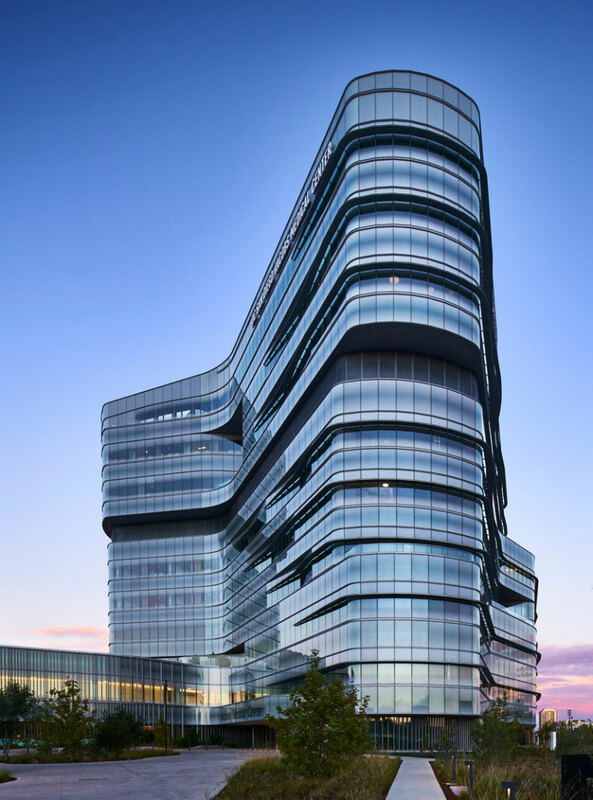 The curvilinear, fritted glass–wrapped 245-bed hospital tower works to unify these concerns by merging three specialty centers— high-risk obstetrics and neonatal care, cancer care, and advanced surgical care—into a vertically integrated campus that preserves open ground-floor areas as therapeutic gardens. 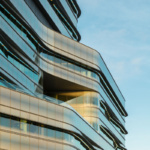 According to Yazdani, the complex was designed with an eye toward the “impact nature can have on the healing process,” and, as a result, many of the ten-story tower’s interior spaces—including surgery rooms—connect directly to exterior views via porous and blob-shaped floor plates. 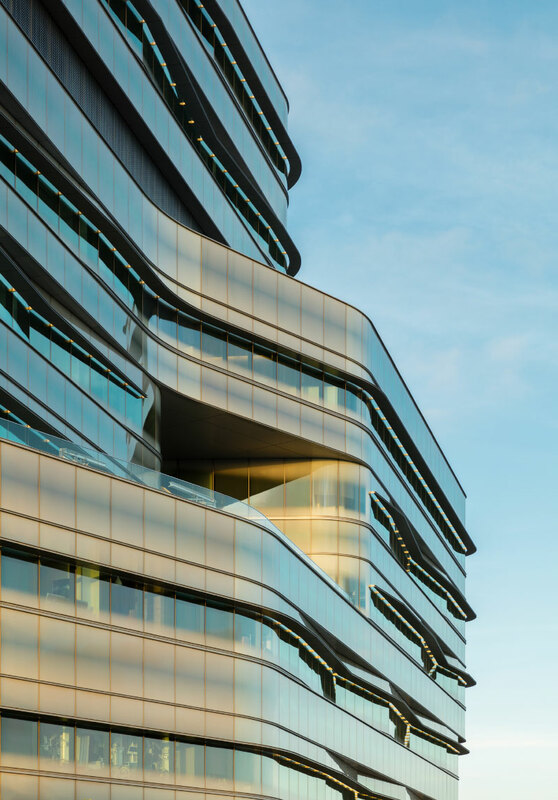 Each level connects directly to either planted terraces or internal courtyards as well, with each floor wrapped in a continuous band of ribbon windows overlooking the landscape. The landscape architecture was designed by Pamela Burton & Company as a set of wide-open paths that thread together outdoor garden rooms to create “wellness walks” that can be integrated into the recovery process. 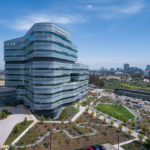 These areas feature an olive grove, a collection of linear gardens, and water-retention basins lined with drought-tolerant plantings.